Wirral Makeup Artist Sue Hazlehurst from Shimmer & Shine can be booked to come to your venue for professional make up for your wedding day. Sue helps take your stress away on your day and makes you feel relaxed and prepared for your big day! She offers high Definition foundation which is more natural than air bushing has less mess and is long lasting to ensure you look and feel great throughout the whole day! Shimmer & Shine will be exhibiting their services at our Wedding Fayre this Sunday 4th March, 12 - 4pm and they are offering 10% off any bookings made on the day of our North West Wedding Fayre! Whether you are still looking for your hair or make up artist or you are looking for wedding ideas and inspiration for your big day we will have it all at our wedding fayre at the stylish and unique canal side wedding location The Holiday Inn Ellesmere Port Cheshire Oaks! It is free for everyone to attend there will be an arrival drink a free prize draw, freebies, samples, free bridal magazines, live music, a mock civil ceremony plus two catwalk shows for you to enjoy at 1:30pm & 3pm! Letter There Be Light offer handmade bespoke, giant light up letters for all occasions including your wedding day! Light up letters are the perfect way to add that WOW factor to your wedding, they look great close to your dance floor at the top of your ceremony and make a great backdrop for your wedding photographers! Letter There Be Light are offering 10% off bookings made from our Wedding Fayre this Sunday 4th March, 12 - 4pm at the Holiday Inn Ellesmere Port Cheshire Oaks! They have also donated use of their LOVE letters for 24hours to one luck Red Event bride and groom in to our free on the day free raffle. Come along and chat with their team to see what they can offer you for your big day! We will have all you need to plan your wedding under one roof and tonnes of inspiring wedding ideas! Enjoy a drink upon arrival, chat with lots of professional wedding suppliers with lots of special offers like these. Watch our catwalk shows at 1:30pm & 3pm featuring bridal, bridesmaid, flower girl dresses and menswear and there will be free raffle to win your wedding singer, meal for to at The Holiday Inn's restaurant and lots more prizes, winners will be announced during our catwalk shows. Free entrance! We are super excited to have Design My Day exhibiting at the Holiday Inn Ellesmere Port Cheshire Oaks this Sunday 4th March, 12 - 4pm. 'As a bride to be myself, and a graduate in Events Management I understand the pressures of pulling off a seamless event, and I’m here to make that happen for you. Their special offer is 10% off any bookings placed on the day of our North West Wedding Fayre! If you’re feeling a bit confused or overwhelmed about all of the options available to you when planning your wedding, why not come and visit their stand this Sunday, 12 - 4pm. They will be more than happy to help you visualise a wedding day as unique as you are! We will have 40 other professional exhibitors or you to chat to and an amazing free raffle to win your wedding singer, groom's suit, bridal make up and many more prizes! We look forward to welcoming you! We have have the fabulous floral arrangements from Perfect Bouquet full of Flowers exhibiting at The Holiday Inn Ellesmere Port Cheshire Oaks Wedding Fayre this Sunday 4th March, 12 - 4pm. To celebrate your engagement they will be offering 10 % off your flower order if brides and grooms will book her services and save the date up until the end of March 2018. Kate has also donated a bouquet to one lucky Red Event winner to our raffle! Be sure to watch our catwalk shows as the winner will be announced and you can see Perfect Bouquets full of Flowers stunning bouquets on our catwalk shows at 1:30pm & 3pm! So whether you are looking for your floral arrangements and more amazing special offers like these the come along to our North West Wedding Fayre this Sunday 4th March, 12 - 4pm for all this and more. You will be welcomed with an arrival drink, goodie bag with a free bridal magazine, over 40 professional exhibitors and lots of inspiring wedding ideas!Free entrance! We are really looking forward to having Louise Granton exhibiting at The Holiday Inn Ellesmere Port Cheshire Oaks Wedding Fayre on Sunday 4th March, 12 - 4pm. You can hire Louise to perform for your wedding reception, ceremony or evening wedding party! If you are still looking for your wedding entertainment then come along to our North West Wedding Fayre 12 -4pm and see Louise perform live throughout the day in the Manfred Suite for a taster of what you can have at your own wedding! Louise is offering an incredible 30% discount for any brides and grooms who book her on the day on our Wedding Fayre WOW! She has also donated into our raffle a free drinks reception for one lucky Red Event bride & groom!! Be sure to watch our catwalk shows at 1:30pm & 3pm when the winners will be announced. Whether you are looking for music entertainment for your big day or you are looking for wedding ideas and inspiration then come along to our wedding fayre as we will have all this and more. There will be lots of special offers like Louise's, free bridal magazine, drink upon arrival, and over 35 amazing wedding exhibitors waiting to chat with you and give you advise on what you can have on your wedding day! Free entrance. We are delighted to have Shlizzy exhibiting at the Holiday Inn Ellesmere Port Cheshire Oaks Wedding Fayre on Sunday 4th March, 12 - 4pm. Shlizzy is a family run ‘Pick Your Own’ fruit farm in the hills of North Wales. The farm has been providing happy summer memories for generations of people for nearly 30 years! They have been lucky enough to be inundated with fruit every year so Shlizzy thought it was time to share their great fruit produce with brides and grooms looking for an extra special gift or favours for their wedding guest. At Shlizzy they infuse quality spirits with fruit they grow from their farm and honey from their bees. It doesn't get more natural than that! The beautiful bottles they use mean that their smaller gins and vodkas make lovely gifts, wedding favours or a pretty little treat for you. Having tried their range, you decide if there is a particular flavour you can’t get enough of! Like what you taste? Then order your bottles of Shlizzy on the day of our North West Wedding Fayre and received an extra 5% off your booking (deposit required). They are also donating a gift bag of 3 miniature gins or vodkas into our on the day free prize draw for one Red Event bride or groom! Winners will be announced during our catwalk shows! Come along to our wedding fayre on Sunday 4th March to have a look at their range of products to see what tickles your fancy and receive your offer. We will have lots of amazing friendly wedding suppliers all under one roof, planning your wedding has never been so easy! Catwalk shows are at 1:30pm & 3pm. We look forward to welcoming you! The Wedding Collection are based in Moreton, Wirral and have an amazing collection of bridal dresses. 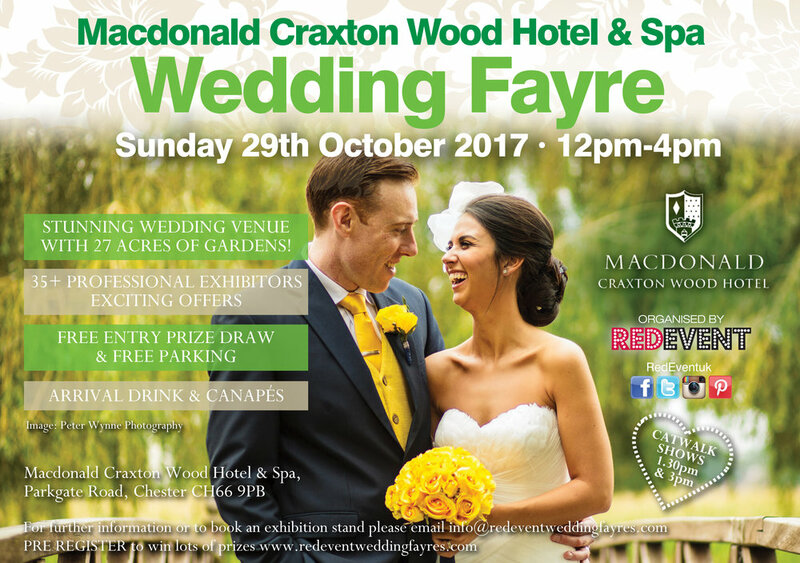 They are offering a fantastic 50% off Bridal on selected lines at the Macdonald Craxton Wood Wedding Fayre on Sunday 29th October 2017, 12 - 4pm. Come along and see for yourself how stunning their dresses are as they will be showcased on our catwalk shows at 1:30pm & 3pm. We will also be announcing the winners of our free on the day raffle before each catwalk show so you won't want to miss it! With styles and sizes to suit all taste’s and budgets you can rely on The Wedding Collection to make you into the beautiful bride you already are! Hollywood Dreams, Demetrios , OreaSposa, Callista Bride, Impressions Bridal. So whether you are still looking for your dream dress or for more Wedding Ideas & Inspiration, don't forget that all important date for our Red Event Cheshire & Chester Wedding Fayre, Sunday 29th October, 12 - 4pm. Free entry, drink and canapes upon arrival. That Cakes The Biscuit is a small family run baking business near to Delamere Forest, Cheshire. They started out baking for Family & Friends and turned their dream into reality in 2013. They specialise in Cakes, Cupcakes, Brownies and Traybakes but have recently started branching out into doing wedding favours, cake jars, a variety of chocolate products and bake your own cookie mixes. They have a 5* hygiene rating and pride ourselves in using only the finest ingredients! They are offering an amazing 10% discount on Wedding Cake bookings if a deposit is paid on the day of Sunday 8th October at our North West Wedding Fayre at the Holiday Inn Ellesmere Port. Whether you are looking to book your Wedding Cake and see more of That Cakes the Biscuit cakes designs or for more Wedding Ideas and Wedding Inspiration we will have it all at our North West Wedding Fayre. Free Entry and enjoy a glass of bucks fizz upon arrival.